Whistler is located about two hours north of Vancouver, on Highway 99, the Sea to Sky Highway. Whistler is one of the world’s premiere ski resorts and was the site of the 2010 Winter Olympics. Whistler is a magical place all year round and well worth a visit, either on your own or as part of a tour. During the winter, Whistler offers some of the best skiing and snow boarding anywhere in the world. During the summer, Whistler features great golf, tennis, biking, hiking, fishing, kayaking, walking and sightseeing. All year round, you’ll find fantastic restaurants, world class shopping and unforgettable accommodations. In summer, hotels are very reasonably priced. There are a number of ways to get to Whistler. You can drive yourself or go by bus, limousine, taxi or float plane. Here is more information about each of your options. This year around bus tour is perfect if you want to spend the day in Whistler, see the sights along the way, spend time shopping and exploring Whistler and then return to your Vancouver hotel at the end of the day. This tour travels along the beautiful Sea to Sky Highway to Whistler. This trip features a stop at Shannon Falls in the summer and fall and Brackendale for eagle viewing in winter. You’ll see mountain lakes and glaciers, rivers, Howe Sound, the small town of Squamish en route. In Whistler, you’ll have time to take advantage of optional sightseeing or adventure tours or simply stroll through Whistler Town Center to shop and have lunch. Price: $145 includes tax and pick up and drop off from your Vancouver hotel. You can also go to Whistler by tour bus and return by float plane. It’s incredibly fun. The per person price is $345 including tax. The float plane leaves Whistler at 7:00 PM every day. If you choose to stay overnight, there’s a 12:45 PM float plane departure as well. Call 604-990-9299 or 1-800-913-9207 or Email for reservations. The road to Whistler is spectacular so, if you drive, you won’t want to hurry. You’ll find plenty of excuses to stop along the way: Porteau Cove with its campground and diving area; Shannon Falls, the Chief, an enormous Granite mass, Britannia Beach, Squamish, Brackendale where you’ll see hundreds of bald eagles in winter, many of them feasting on spawning salmon, than you will in any other place on earth. If you are traveling in a group or simply looking for the most inexpensive way to get to Whistler, take the bus. Skylynx offers year round bus service between downtown Vancouver or Vancouver International airport and Whistler. The price varies by season. Greyhound buses depart from Vancouver for Whistler as well. Prices are about C$27 in each direction. You can take a taxi from the Vancouver airport to Whistler for about $250. From downtown Vancouver to Whistler, the taxi is about $250 one way. Scheduled flights are available each day between Vancouver & Whistler from approximately May 2 – September 25, 2017. The flight between downtown Vancouver and Whistler is one of the most scenic flights in the world. You fly along the coastline of British Columbia and then over Garibaldi Lake and Park, Black Tusk and numerous lakes, glaciers and icefields. It’s an amazing ride. 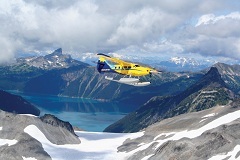 You can also go to Whistler on a tour bus and return by float plane for $345 per person including tax. Adult: $201 per person each way including all fees and tax.